We all know someone who refuses to read the instructions, and sometimes it works out fine for them but other times it leads to a bit of a mess. While there are some people like this, others feel it is important to always do their research before stepping into something new. 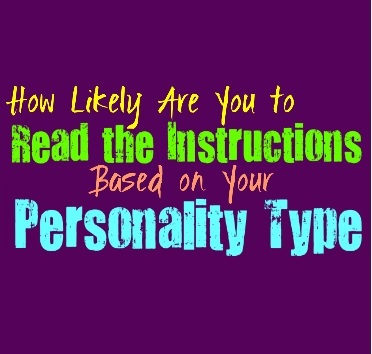 Here is how likely you are to read the instructions, based on your personality type. INFJs aren’t incapable of reading instructions, since they do enjoy being prepared for most things. For them it is about learning and being open to the things they don’t yet know. If they know how to navigate something fairly well, then they won’t necessarily feel a need to read the instructions. For the INFJ it is about learning and working through the information they have. They don’t need to read instructions for everything but they certainly aren’t afraid of admitting when they aren’t prepared for a task and need a little extra information. ENFJs are not incapable of reading instructions, especially with something they don’t know well. They actually enjoy doing research and learning how to be the best at what they do. In some situations they can be a bit stubborn and don’t want others to see them as imperfect, and so they might be afraid to read instructions if it will make them look bad. In most situations the ENFJ is comfortable and happy to read the instructions in order to learn and help improve their abilities. INFPs might not always feel like reading instructions, since sometimes they prefer to wing it with things. They will read the instructions if it seems interesting and if they feel like they can actually learn something from it. In situations where the instructions are boring or drag on for too long, the INFP might become a bit distracted by something else. They would often prefer to try and get things done themselves, but sometimes this can lead to them having unfinished projects. ENFPs don’t usually find themselves wanting to read the instructions, especially if they find them rather boring. ENFPs prefer to go with the flow and try to take care of things themselves, without having to depend on useless instructions. They do enjoy doing research but for them this is something they do in their own time for a sense of entertainment and fulfillment. When it comes to reading instructions they might be a bit stubborn and find themselves attempting to handle it without this step. INTJs are naturally readers, who enjoy being able to do plenty of research and learn about things themselves. Sometimes this means they will be more than happy to read the instructions, so that they can get the job done without failing or making any mistakes. There are some instances where the INTJ feels like they already have enough knowledge and so they don’t really need to waste time reading instructions which likely won’t provide them with much information. Most of the time though, the INTJ won’t mind taking in a little extra information in order to be capable of handling any project. ENTJs are researchers who believe in being prepared for every situation that comes their way. They do often prefer to read the instructions, even if they just skim through them quickly. They want to be prepared for things and dislike walking into any situation without knowing everything they should know beforehand. For the ENTJ sometimes reading instructions can feel like a waste of time if they have already done plenty of research and feel fully experienced with a project, but they will often do their best to take in even more information if they have to. INTPs are often researchers who enjoy learning as much as they can about pretty much everything. In some instances they might feel like reading the instructions is completely pointless and a bit boring, especially if they already know a lot about the project or situation. They are logical people who love learning as much as they can, but sometimes they also like going with the flow instead of constantly having to be strict about their approach. They can be a bit unpredictable in this way, and sometimes prefer instructions while others times it feels too daunting. ENTPs do enjoy researching and learning about different subjects, but that doesn’t mean they always decide to read the instructions. For them certain instructions can feel a bit draining and boring, and so they will avoid diving into these things. Most of the time ENTPs enjoy learning and diving into new things, but sometimes that means not having to read the instructions beforehand. For the ENTP it is rewarding to go with the flow and take things on their own way. ISTJs are likely to read the instructions with just about anything, since they prefer to be prepared. They don’t like jumping into something without following the steps and learning how to do it properly. For them it often feels like a waste of their time if they don’t read instructions, since this can lead to mistakes. ISTJs don’t like making mistakes and believe in working hard to get things done the right way. For them reading instructions is just an important step in getting things done efficiently. ESTJs definitely believe in reading and following instructions in order to get things done. They will often take the time to read everything carefully so that they can properly prepare for what they are about to do. Sometimes the ESTJ might realize that certain steps don’t fully make sense, and in these situations they aren’t afraid of implanting methods with are more efficient. ESTJs simply believe in always reading the instructions so that they can be completely prepared for what they are taking on. ISFJs are usually more than happy to read the instructions, since they don’t like being unprepared. For them it seems a bit pointless to jump into something without reading instructions and doing what they can to get it done efficiently. ISFJs don’t like walking into tings without doing their best to be prepared, especially since their loved ones are often depending on them. ESFJs can be perfectionists, and because of this they often prefer to read the instructions with most things. They want to be sure they are doing everything properly, and want to do their best to avoid making any mistakes. For the ESFJ it is truly important to take care of things the right way, since they often have a lot of people depending on them. They will certainly read the instructions with most things, and even do extra research before taking the next step. ISTPs are definitely drawn to facts, but sometimes they can struggle to really focus on reading instructions. They are complex people in the sense that they believe in researching and learning, but also like to live in the moment. There are times when they become so focused on the present that they don’t really want to take the time to read the instructions, especially if they feel like they can figure it out themselves. ESTPs are very hands on people, and whether or not they read the instructions often depends on their current mood. In some situations they prefer to read the instructions in order to be prepared and learn as much as they can about a situation or task. There are other times when the ESTP just wants to go with the flow and so they won’t want to waste their energy reading the instructions, especially if they feel like they already know enough about their task or project. ISFPs aren’t usually interesting in reading instructions and can actually become bored with this. They prefer to live in the moment and go with the flow. For the ISFP reading instructions often feels a bit draining and even pointless. They enjoy working with their hands and will do their best to accomplish things on their own terms. While sometimes this can get the ISFP into messes, they aren’t afraid of handling it themselves. ESFPs don’t always enjoy reading instructions, but it entirely depends on their mood. If they are feeling like they need to prepare they will do their best to read the instructions and get it done themselves. Most of the time ESFPs become annoyed with having to take time to read the instructions and might just attempt to wing it. They are often good at doing things themselves and aren’t afraid of taking on something new and challenging.